Winter in Waukee usually brings bitterly cold temperatures and flying snow, forcing many to bundle up and stay inside until the spring thaw. But, the Iowa Wild, in partnership with Wells Fargo and the City of Waukee, wants to change your winter plans to include getting outdoors and onto the ice this season through its Community Rink Project. The Community Rink Project transforms local parks and recreation areas into community ice rinks. Once the metro area maintains consistently freezing temperatures, the rinks will open in three suburbs: West Des Moines, Ankeny and Waukee. This year, Ankeny and Waukee will open their rinks for the first time. Last December, the Iowa Wild hosted its first Community Rink Project ribbon cutting, when it opened its location in West Des Moines. Fisher says the Iowa Wild couldn’t be more pleased with how the first year went. Waukee’s rink will be located at Sugar Creek Golf Course, just a couple miles north of interstate I-80, and is free to everyone. Rink hours are similar to/dependent on park hours, or roughly sun up to sun down. Outside of these hours, the rink will only be closed if temperatures get too warm, compromising the ice and overall safety of the rink. Visitors need to just bring their own pair of skates, which can be found at certain retailers in town or online. While the public starts taking to the ice outside, the Iowa Wild will prepare for its fifth season at Wells Fargo Arena. Coming off its best season for attendance—averaging over 6,000 fans per game—the Iowa Wild expect another successful year. Fisher says the celebratory milestone anniversary also has the Iowa Wild prioritizing community involvement even more. In addition to the Community Rink Project, the Iowa Wild sponsors many different efforts already, including several with an emphasis on education. Wild About Reading, which the National Hockey League also supports, encourages elementary and middle school students to build a passion for reading in and out of the classroom. Based on different reading goals, students have the opportunity to receive ticket vouchers to attend Iowa Wild games, along with other prizes. Another school-based initiative is the Healthy Living Floor Hockey program, where the Iowa Wild, in partnership with other local businesses, such as Atlantic Bottling Company, have donated floor hockey games and sticks to more than 100 schools in Iowa. Additionally, the Iowa Wild continues to offer its Wild About Education school-day game, which saw over 13,000 area students in attendance last year. More recently, the Iowa Wild began a newer program, called the Junior Crash Course, where kids between the ages of 4-12 who have never played hockey before receive free equipment and six on-ice skating sessions to learn the game and how to play. Capped at 50 participants, registration filled up in just 10 days. Fisher says it’s through programs such as these that hockey is gaining momentum locally. Nationally, USA Hockey reports the same positive trend in overall sport participation. A current membership statistic shows growth not only in the number of players, but of coaches and officials, as well. From 2015-2017, USA Hockey reports a total growth of roughly 15,000 participants. In Iowa, almost 4,000 players are registered through USA Hockey, which doesn’t account for those learning the game through other opportunities. 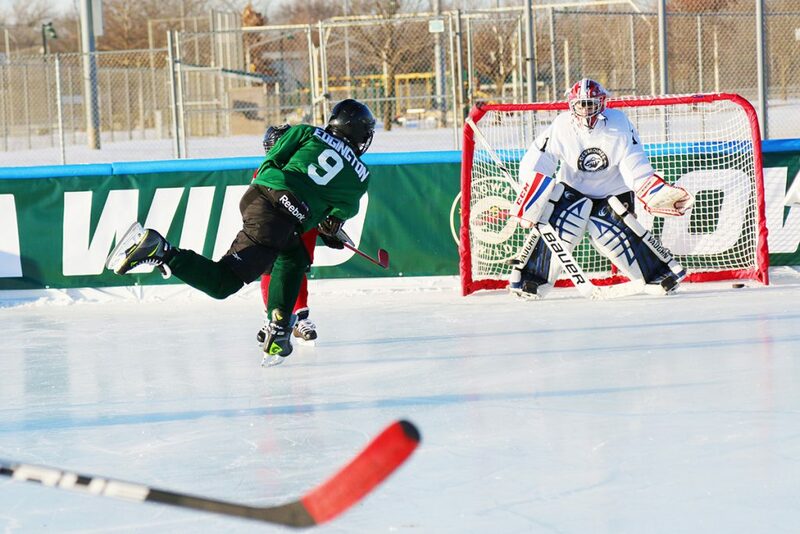 The Iowa Wild is also beginning its Hockey Days in Iowa this winter with the Iowa Corn Association, which features an outdoor 3-on-3 tournament. And, through the Minnesota Wild Foundation, the Iowa Wild plans to start a sled hockey league in the late fall for paraplegics. With so many opportunities for community outreach, Fisher says the Iowa Wild players love to get involved whenever possible. As a whole, Fisher credits healthy relationships with corporate partners, as well as Central Iowa residents, for fostering the growth of hockey and how the Iowa Wild is able to give back.